Julia Rothman, a fellow RISD grad, recently invited me to share my sketchbook at her blog, Book by Its Cover. Some of the sketches may be familiar to readers of this blog, but there are some new ones as well. I hope you enjoy the tour. Thank you for the invitation, Julia (and thanks for throwing my name in the hat, Mom! 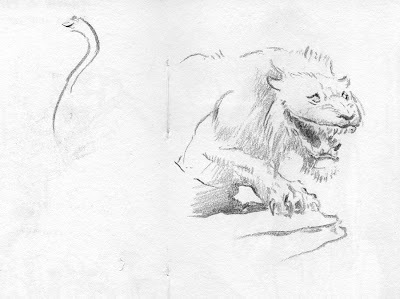 By the way, the above sketch was drawn during my visit to the Frazetta Museum, which I highly recommend visiting. i would love to go to that museum someday. You see quite a bit of it in the Frazetta documentary "painting with fire"
just got Fire and Ice on DVD and admiring the character design. the backgrounds were done by James Gurney and Thomas Kinkade. love the sketch. i believe its from one of Frazatta's ink drawings. Thanks, Eddy. I've been meaning to rent that DVD. The sketch is actually from Thuvia, Maid of Mars, which is probably my favorite Frazetta painting. You can see it here. Thats a great Frazetta painting. i remember seeing that in one of the early Frazetta books published by ballantine. the DVD "painting with fire" is definitely worth seeing.